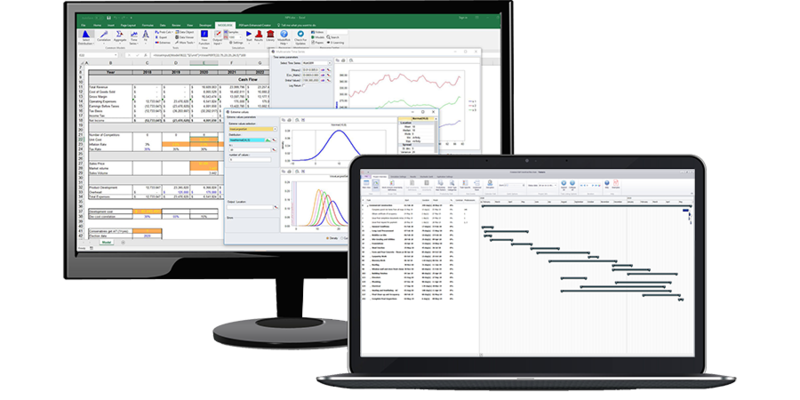 @RISK is a Monte Carlo Excel add-in from Palisade Corporation. If more than one Excel workbook is open, the converter will operate on the active workbook only. We recommend that the Rename file option is selected to ensure that you do not overwrite your model. By default this will create a new workbook stored in the same directory as the active workbook with ‘Converted’ appended to the name, but you can enter a different name in the New name field. Note: it is not necessary for @RISK to be running or be installed in order to perform the conversion. This lists all of the cells in which there were @RISK functions and shows the original and converted formulae together with a comment on whether ModelRisk was able to find a suitable formula. The @RISK converter does not currently convert any @RISK VBA functions. Not all @RISK spreadsheet functions have an exact equivalent in ModelRisk. For example, the RiskCompound function in @RISK is equivalent in purpose to VoseAggregateMC or VoseAggregateDeduct in ModelRisk, depending on the options selected in RiskCompound, but ModelRisk uses distribution objects to define the variables to be summed, whilst @RISK does not. The conversion report identifies where there is no direct conversion possible. will return the mean of the Normal(100,10) distribution. This has the benefit of making it clear what exactly the output sensitivity is to each distribution, which may not be apparent in the @RISK formulation above. =RiskTheoMin(A1) which returns 0, the minimum value that the Gamma distribution may take. Then =VoseMin(A1) returns the same value of 0. Note that some properties of a distribution are infinite (in which case ModelRisk returns “+Infinity”) or undefined (in which case ModelRisk statistical functions return “Undefined”). Tested versions of @RISK return #VALUE!. @RISK uses rank order correlation with a method developed by Iman and Conover some 30 years ago (Iman and Conover, 1980; Iman and Conover, 1982). Iman and Conover’s technique gives very similar results to using the multivariate Normal copula in ModelRisk. @RISK uses RiskCorrmat, RiskIndepC, and RiskDepC functions to produce correlations between variables. In contrast, ModelRisk simulates from copulas and connects the copula values directly to the appropriate distributions using the optional U parameter. If there is any correlation in your model, the converter will create a separate sheet called ModelRiskCorrelation in which it will place the ModelRisk copula functions, and it will connect the copulas to the distributions in your model. Note that ModelRisk offers many types of correlation structures (i.e. copulas, which are the more modern approach to modelling correlation), and can estimate correlation structures from data, so you may wish to take the opportunity to update your model with a more appropriate correlation structure. The converter does not currently convert the multiple incidence feature of RiskCorrmat. @RISK and ModelRisk use different numerical methods for estimating properties of distribution like its moments (mean, variance, etc). ModelRisk uses known equations for calculating moments where they exist (i.e. where there is a known formula using the distribution parameters), and it appears that @RISK does the same. However, where distributions are truncated there do not generally exist any exact equations for the moments, and @RISK and ModelRisk results may differ significantly. ModelRisk uses advanced adaptive numerical integration for continuous distributions, returning calculations with very high accuracy, and summation techniques for discrete distributions. In this spreadsheet you can test a few @RISK and ModelRisk estimates of a truncated distribution’s mean where a formula also exists. ModelRisk does not use these special case formulae, but does use the same numerical methods for all distributions, so this should provide you with a neutral test of the accuracy of the approach of each product. If you deliberately use the #VALUE! as part of your model logic, you may get different results with ModelRisk. For example, using Excel’s ISERROR or ISERR functions will generate FALSE for the ModelRisk error message, but TRUE for @RISK’s #VALUE!